No WSJ puzzle today due to the holiday. Please celebrate responsibly, i.e. by treating all of your fellow humans with dignity and respect which you really should be doing every other day, too. Enjoy the day! This is Sean Biggins’s debut in the NYT, and it’s a special for Martin Luther King, Jr Day. I liked it a lot and look forward to seeing more from Sean. Each theme answer ends in a word that is also a name. 16a [Regal] is FIT FOR A KING. 22a [Yosemite and Yellowstone] are NATIONAL PARKS. 47a [Something promised in a court oath] is THE WHOLE TRUTH. What do they have in common? 57a [Cause championed by the figures named at the ends 0f 16-, 22-, and 47-Across] is CIVIL RIGHTS. That would be Martin Luther KING, Jr, Rosa PARKS, and Sojourner TRUTH. While it sometimes seems we are moving backwards in the fight against racism, talking to my daughter and her friends is reassuring. Here’s to the next generation – we are leaving them too much to do, and they are up to the task. 1d [Dismissive sound] is PFFT. This made me smile. 25d [Green building certification, for short] is LEED, which stands for Leadership in Energy and Environmental Design. 27a [Mike who was a three-time N.L. M.V.P. with the Phillies] is SCHMIDT. He’s an icon around here. 32d [Go to bed, informally] is HIT THE HAY. Now I want a nap. Giving football equal time: 62a [___ Beckham Jr., three-time Pro Bowler for the New York Giants] is ODELL. He is not an icon around here. What I didn’t know before I did this puzzle: that ROD LAVER won eleven Grand Slam titles. He was in his heyday when I first started watching pro tennis. I knew he was great, but couldn’t have given you the number. Each of the past two weeks I have been rushed doing this puzzle and the write-up. Not today, though, as I’m off from work. I JAUNTED to a nearby coffee shop. Rather than drive, or jog at an EASY PACE, I drove, which, notwithstanding BEQ’s clue, [Went on a short walk], is an okay way to jaunt. Did I ASK FOR my usual latte with an extra shot? Yup, I did. Then I sat back in a comfortable seat, hoping for a FANTASTIC experience, though not in the sense of it being [Made-up]. I was UNABLE to zip through it, as there were several interruptions from friends coming up to say hi. I tried to remain DEADPAN after reading the clue for 21d, [Arthritis medicine that would score high in Scrabble]. Though I was not optimistic, this answer, XELJANZ, came together nicely from the crossers–and I needed each and every letter! So, I guess you could say I ATE DIRT as I pieced it together. I have a nit to pick, and it’s RELATED TO the clue for 14d, [Part of the family]. No matter how I try, I cannot come up with a usage in which the clue and answer substitute. Again, I am reminded of the rule against long partials and how it leads to non-FITB clues that are just a tad off-kilter. A similar nit applies to 9d [Role play?] ACT IN. Someone please correct me if I err. LAVA ROCK and BRA MODEL both look, sound, and feel like green paint to me, but who really cares? 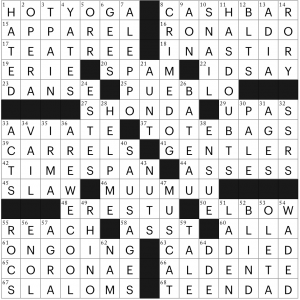 The latter was a non-theme entry in a Sunday Los Angeles Times puzzle by Dan Schoenholz in 2010, and it gets 261,000 Google hits. The former was a non-themer in a Tuesday LAT by Jacob Stulberg in 2016; it gets 4,000,000 Google hits. They’re lively, they’re accessible; why let the fact that they are not in the dictionary keep them out? 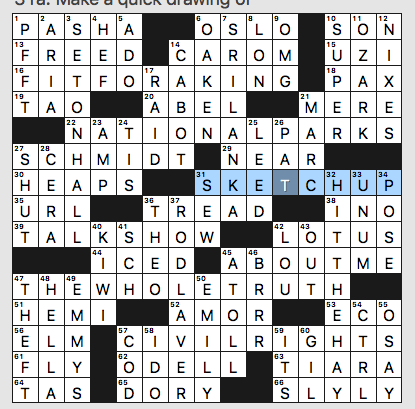 However, I cannot but wonder how women feel about the latter as a crossword entry. Any takers for a discussion of that issue? 1a [Ant killer] SQUASHER–I struggled with this one, wanting it to be some kind of spray, but as it materialized from the crossers, I immediately liked it a lot (please don’t tell ASPCA or PETA). 17a [Little arboreal croaker] TREE FROG–Somehow, I knew this one immediately, and that’s always a feel-good moment. 64a [Stones whose name means “fingernails”] ONYXES–Who knew? Not me. And now I’m glad I know. 2d [Port city with three walls in “Game of Thrones”] QARTH–This is as new to me as it to Ginsberg’s database. 32d [L.A. neighborhood west of MacArthur Park] KOREATOWN–I’m not that familiar with L.A. geography, but having played golf in Brentwood once, I tentatively inserted that until TWEEZE and ONYXES mandated revision. 33d [“Heartache Tonight” singer] GLENN FREY–Always good to see an old Eagle in a puzzle, and I’d forgotten over the years that he was the one singing this song. All in all, a very enjoyable experience. With 72 answers, 29 blocks, 12 3-letter words, and 12 entries of 8-or-more letters, it was nicely balanced. I counted 18 ILSAs and 3 ILSA-lookalikes. It was satisfyingly crunchy, like a breakfast of MUESLI. [8a: It’s no place for free spirits]: CASH BAR. Brilliant pun, though I consider myself a bit of a free spirit and I’ve graced many a cash bar. [16a: Soccer star Cristiano who was the most-followed athlete on Instagram in 2018]: RONALDO. My 13-year-old son is a huge Premier League fan and has a Ronaldo jersey (not sure if Ronaldo is the best role model, given that he’s been accused of sexual assault on several occasions). [8d: McGruff’s job title]: CRIME DOG. McGruff the Crime Dog was a cartoon character in a series of PSAs from the ’90s who told you to “take a bite out of crime”; with his trenchcoat and Brooklyn accent, he looked and sounded like a canine Columbo. Remember, users are losers. [26d: Flat-bottomed boat]: BATEAU. This was a new one to me — I knew that bateau was French for boat, but not that it was a term for a specific kind of boat, most commonly used for river cargo. – We have a nice balance of women and men in the grid, which I’ll take any day. The women include Auntie MAME, TALIA Shire, ETTA James, and ENYA. FWIW, RUTH could have easily been clued as [___ Bader Ginsberg] instead of as [Baseball’s Babe]. 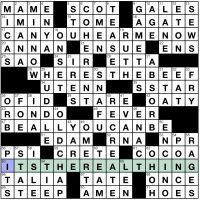 – “Dear EVAN Hansen” and “Rocky” were reference in the puzzle, and that helped things not feel as dated. This entry was posted in Daily Puzzles and tagged Brendan Emmett Quigley, Elizabeth C. Gorski, Kurt Krauss, Sean Biggins. Bookmark the permalink. I disagree with cluing “Hemi” as “Hot-rod engine, informally”. Hemi is a trademark of Chrysler for a specific design feature used by engines on a range of vehicles from sports-cars to trucks. I got it easily, but don’t find it acurate. A clue is a hint, not a definition. Looking at hemi examples shows that this clue isn’t a bad hint. 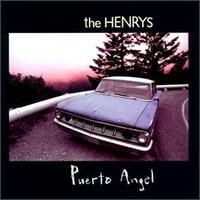 It is more of a muscle car “Plymouth Road Runner” feature. 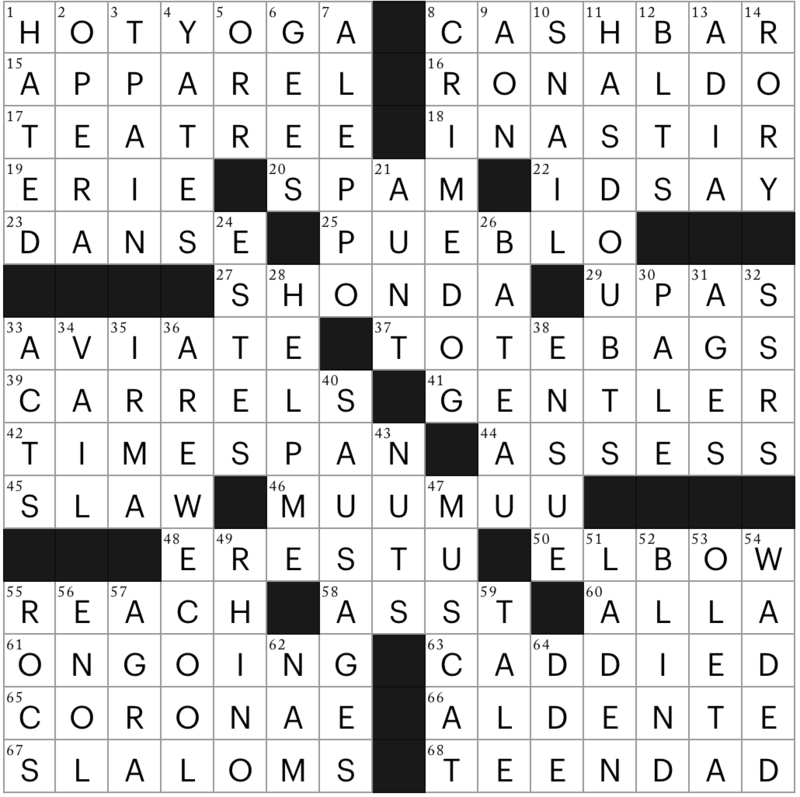 Funny that both this puzzle and Friday’s WSJ Contest had the 3-R BRRR in it. Very appropriate timing for those of us in the northeast! Also in Virginia. Maybe not Northeast cold, but still, it was 12F with a wicked wind when I ran this morning. So, BRRR, yes, perhaps even a couple more Rs. Stay warm! I don’t understand you runners and your willingness to run in all sorts of terrible weather, Lise! And I say this as someone married to a marathoner who is basically always training for his next big race. I have so much respect and awe for marathoners; I think the ability to train and run that far is amazing and far beyond my capabilities. Kudos to your spouse! I love running, although sometimes I fall into the “it feels so good when you stop” category. We’re all just different kinds of crazy. I liked this; thanks for sharing. They have a penchant for wordplay, I see. TNY – Hey, Lise. I stumbled at the same crossing (9D/16A). I was pretty confident that an “e” would do the trick but when I got the signal that something was amiss I had to resort to the red letters. Never the less, another fun puzzle from Gorski and TNY. Hey, I guessed “e” too. When the puzzle was done – I do it in print – I looked up the soccer player. The company name does sound vaguely familiar. Good to know. That url doesn’t work for you? Opens fine for me. And a very enjoyable Gorski puzzle it is! then, no, it is not a valid URL. If you mean you can print from the page without a pdf, I suppose. 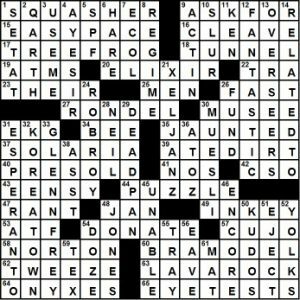 I’m saying https://cdn3.amuselabs.com/tny/crossword-pdf took me to a valid page from which I could access the .pdf file. I tested this by virtually printing the file to my desktop. and click Print (then Blank Puzzle) to get the pdf. It puts that pseudo-URL in the browser address box, but if you save that URL and go to it you get a 404. The server takes you to the pdf and makes up a fake URL. I should have double-checked that url before offering advice. Thanks, Martin. Still, I hate to say it, but I just tried again now, and no dice. And no, never tried to access a URL of my own entry or in a link here, apart from the guess at “correcting” the dummy URL. And that was only because, no, it most definitely did not take me to a pdf. In the end, I printed what I had, although it didn’t look quite right (rather large at that). I’m guessing they messed up in creating a link, which would explain why it opened a non-pdf in a URL with pdf in it. FWIW, it was a typical TNY Monday, so very name heavy. Like others, I was put off by RONALDO / AON. (I also first guessed ASIA for the song, but RONALSO looked even sillier, so I got that right.) I’d never heard of either, and then AEN looked even worse, but RON rather than REN didn’t look plausible either. I refuse to blame myself or you guys if you couldn’t get it. Bad fill. I also had trouble in the NW. I hadn’t heard of the OPERA, the mosque in ALEPPO, HOT YOGA, or the oil in a TEA TREE, but at least they were all kinda guessable, which is good, because T-PAIN sure wasn’t. I did end up with a guessed fill. I just didn’t enjoy it.